Jacumba is an area of low mountains, eroded canyons and flat sandy desert, in a very little visited part of California along the Mexican border, south of I-8. The scenery is similar in variety to the much larger Anza-Borrego Desert State Park which borders it to the north - the two regions share parts of the Jacumba Mountains which are the last major range of the coastal hills, as beyond, to the east, stretches the great Sonoran Desert. 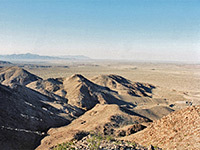 The outstanding natural area status is a recognition of the varied geology - there are many rock formations, fossils, patches of mineralization - and also for the wildlife and plantlife; the springs, canyons and oases shelter unusual species such as California fan palms and crucifixion thorns, and herds of peninsula bighorn sheep roam the hillsides. 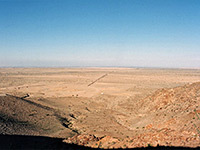 The preserve is also known as the Jacumba Mountains Wilderness. Despite this interesting terrain, Jacumba ONA is not signposted and has no facilities, though the small town of Jacumba a few miles west does have a store, post office and a few official buildings. 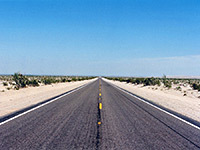 The natural area is located southeast of I-8 just where the highway turns due north at the San Diego/Imperial county line and splits into 2 widely-separated lanes for several miles. 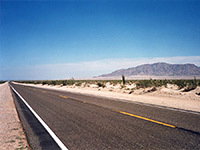 There is limited access by road, from CA 98 which joins the interstate at the Ocotillo exit (mile 90) - along here, three short side roads head south towards the mountains and one (Clark Lane) links with a 4WD route into the backcountry. There are no specific viewpoints and the two reasons to visit are perhaps either to spend several days exploring on a backpacking trip, or just to stay one night beside the road - this is generally a peaceful location with scenic surroundings and very little traffic yet just a few miles from the interstate. Climbing a few hundred feet into the hills is enough for far reaching views over a large area of flatness over I-8 towards Anza Borrego and the Imperial Valley. The area has unusual rocks, including nice specimens of mica, calcite and garnet. 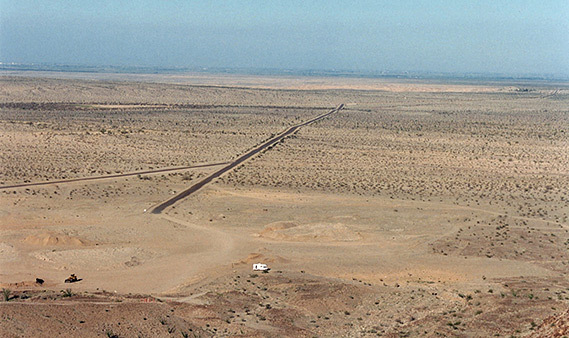 To the east, the mountains drop down to the sandy plains of the Yuha Desert, a large area completely flat and quite undeveloped; CA 118 and I-8 both cross the basin with dead straight sections of over 15 miles. The boundary with Mexico is just 3 miles south of CA 98 and so the whole area is frequently monitored by the border patrol. The emptiness stops at the edge of Imperial Valley, as beyond here the desert has been transformed by irrigation and used to grow a wide variety of produce. Here are found the nearest towns with hotels - closest are Calexico and El Centro, both about 25 miles away.